(SitNews) Ketchikan, Alaska - Entering its 11th fishing season, Chinook Shores Lodge will be adding four 21' Silver Streak boats to its unguided and bare boat fleet. Chinook Shores Lodge, an Alaska fishing lodge specializing in guided charters and self-guided fishing, is located approximately 15 miles north of Ketchikan on Potter Road. Quoting a news release, the purchase decision is part of management's desire to ensure that Ketchikan-based Chinook Shores Lodge remains a leading destination for those interested in Alaska sport fishing. Chinook Shores' first custom-built Silver Streak entered into service June 2015. Boats two and three will go into service May 2016, the fourth will go into service June 2016. 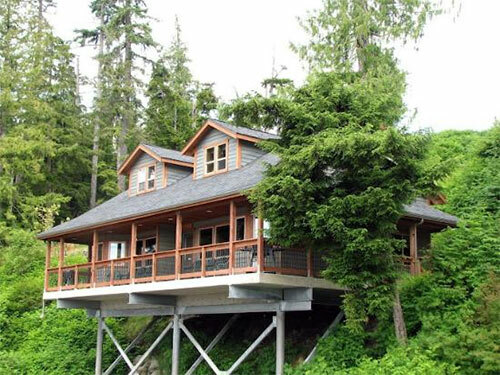 Pictured is the duplex which is built out over the beach. All units feature the same floor plan and can sleep up to six people. "These custom-built, aluminum sport fishing boats promise our continued delivery of best-in-class sport fishing to anglers and guests while greatly enhancing the experience for our bare boat renters, unguided anglers, fishing guides and operational staff," said Alaska fishing lodge owner and guide Jeff Wedekind. Silver Streak Boats, based out of Sooke, BC, Canada, has been building boats for nearly 30 years, and has earned a reputation as being one of the elite west coast boat builders. The custom-built sport fishing boats for Chinook Shores Lodge will feature:. "For years we have promoted sport fishing in the calm and protected waters of the Inside Passage in Southern Southeast Alaska while offering the best equipment and gear to our guests, and I am thrilled to add these rugged, virtually unsinkable boats to our fleet," Wedekind added. Located in Southeast Alaska, Chinook Shores Lodge is easily accessible via direct, non-stop flight from Seattle, Washington. Accommodations include private waterfront beach houses with full amenities, private dock access, six self-guided fishing boats, Alaska charter fishing, quality controlled fish processing and fish packaging services.